Maureen has been involved in the glass industry as a publisher since 1985 when she became cofounder and managing editor of Glass Patterns Quarterly. This quality, tutorial-based periodical has an international readership in over eighty countries. Maureen’s desire to provide a vital business resource for glass professionals later led to the birth of Profitable Glass Quarterly and the subsequent ownership of Glass Art Magazine. In 2012, she was awarded the Lifetime Achievement Award from the International Art Glass Suppliers Association. Maureen currently serves on the Board of Directors for the KBW Educational Foundation. Mrs. James is an active and voting member AGA, ISGB, GAS, and SGAA. She and her staff manage the demonstration stage that runs throughout the Glass Craft & Bead Expo each year in Las Vegas, Nevada. She has been influential in bringing glass education to the masses and is thrilled to be working with the various organizations serving in this capacity. 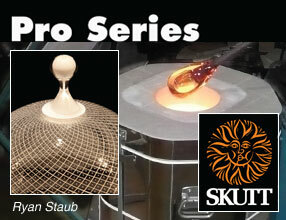 2013 saw the development of Glass Expert Webinars where glass experts share their techniques live on a global scale. Jennifer and husband Wil released the first issue of The Flow in November 2001 at the Albuquerque Flame-Off and have embraced all forms of lampworking, including pipes, from the very beginning. Jennifer and Wil were dedicated to making The Flow a success but also needed to keep up with their glass business, which was more than a full-time job. They found it difficult to continue their publishing responsibilities alone and decided that it was time to enter into a partnership with Steven and Maureen James, who were already publishing Glass Patterns Quarterly and Profitable Glass Quarterly. Jennifer still makes flameworked glass art with Wil but also serves as editor of The Flow and makes the day-to-day decisions regarding which articles will be used and how they will appear, thus setting the course for the direction of the magazine. She also continues to establish and maintain relationships with the many glass artists who contribute to The Flow, making it a fabulous resource for the flameworking community. 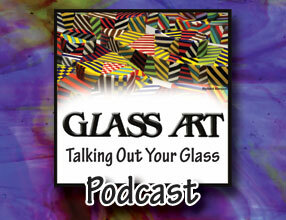 Wil discovered glass in 1998 when he encountered Bob and Marie Snodgrass in Eugene, Oregon. He found his expression in the art of the marble, creating orbs of up to four inches in diameter. Wil’s more recent work incorporates blown glass elements with sculpture, and he uses the incalmo technique of merging separate blown vessels with powders and Graal. He is ever passionate about flameworking and teaches workshops around the nation, including at the Eugene Glass School, as well as in his Texas studio. His work can be found in the collections of Dale Chihuly, the National Marble Museum, the Dallas Museum of Art, the Pepsi Corporation, and the Wal-Mart Corporation. As founding editor of The Flow, Wil sought, along with his wife Jennifer, for a way to provide a bond among members of the lampworking community. That has been accomplished by developing relationships with the finest artists and sharing their techniques with readers of The Flow through in-depth, step-by-step tutorials. Dave enjoys watching the issues of The Flow come together as he works on laying out articles, advertisements, and the various sections devoted to new products. He likes to stay one step ahead of the schedule to insure that we have materials that are adequate and on time. He keeps all of the stages of magazine production flowing before moving on to the website updates. He is also on the e-mail team and produces most of the images that you see on our website. Dave has a methodical approach to his work and with all the various formats that need to be delivered, he is able to do the same thing, the same way every time. Dave was part owner of an art gallery where he was involved in various art shows, and he designed and has constructed stained glass projects for Glass Patterns Quarterly. Everyone who works with Dave loves and appreciates his easygoing style and positive attitude, and his jovial nature is definitely a stress reducer in a deadline-oriented workplace. Didi's immense energy, enthusiasm, and fresh ideas are an important benefit to The Flow. She knows many of the artists and encourages many of them to submit their new techniques in the form of tutorials to The Flow and Glass Patterns Quarterly. She is a relationship builder and strengthener, and her suggestion and intuitive pairing often benefit both parties. Didi has been in the glass industry for many years and has run her own business. Her entrepreneurial spirit allows our publication to reach out and think outside the box. You will often find Didi in the booth at one of the shows, and she is always engaged. Her knowledge of the flameworking industry and community make her an important part of The Flow team. Kathy has worked with the company since the inception of its sister publication, Glass Patterns Quarterly, and is the company's longest serving employee. Her experience and knowledge of the department allows Kathy to provide excellent customer service. She is responsible for maintaining the ever-increasing database of The Flow subscribers, distributors, and advertisers and also manages monthly updates and reports for the publications as well as for our website www.theflowmagazine.com. In addition, she manages the renewal series in circulation, which includes both USPS and e-mail renewal efforts, and oversees all subscription efforts and new trials. Kathy also insures that the paperwork and lists are at the printer and mailing house on schedule and has helped to bring a twenty-five year, on-time, non-interrupted record to the three titles that she manages. Adam is a lampworking artist and represents the voice of the boro market. He attends almost all of the boro events and, as an artist in the community, listens to the needs of this particular niche. At the gatherings and shows, Adam has interviewed some of the “greats” in the art glass community, and his professionalism serves him well. You can follow Adam's day-by-day accounts of the shows within the magazine, on our website, and through our editor’s blogs. Mark translates his vast talent and experience in the world of glass art into remarkable article and ad layouts for The Flow. He also lends his eye for color and light to Glass Patterns Quarterly as a stained glass design artist. His firsthand knowledge and insight into running a stained glass retail store was instrumental in the early years of GPQ. He creates most of the graphics that appear in our publications as well as on our website. Mark’s honest and forthright assessment ability allows Mark to produce layouts that are clean and interesting for articles and has allowed him to build successful ads for several advertisers of The Flow. If you need a fresh ad message, consider using Mark to design your next ad. Darlene brings to The Flow experience as a writer, proofreader for various book publishing companies, and private school library teacher responsible for mentoring her students in the annual “Young Author Awards” sponsored by the Courier-Journal. Darlene works to assure continuity and accuracy and also serves as one of the contributing writers for the magazine. Her easy yet professional style allows her to work with a multitude of glass artists, writers, and designers, assisting them in telling their stories and showing their techniques. She strives first and foremost to get it right while allowing writers who contribute to The Flow the opportunity to be happy with the final results. She has implemented a series of proofing stages to insure correctness in techniques and details by allowing the writers a last chance to look over their material before it goes to press. Darlene also edits our staff letters and anything that goes on our website and newsletters.